← New US-China Trade Understanding — Not Much Substance. Better than Nothing? 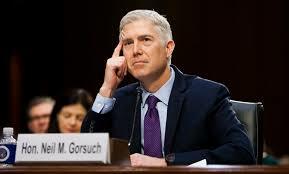 JUSTICE GORSUCH, INTERNATIONAL LAW AND U.S. LAW — Justice Gorsuch displayed a somewhat confused & restricted approach to international & foreign law during his Senate confirmation. There is a critical distinction between international law and foreign law. International law (both conventional and customary) are incorporated into US law as the supreme law of the land under Article VI of the U.S. Constitution. Judges need to know this (judicial notice). Foreign law, considered a fact issue in the U.S., belongs to the world of comparative and conflict of law. This often needs expert testimony. The big issue today is will the Supreme Court look at legal solutions by foreign courts as a means of understanding today’s global problems. Not in interpreting the Constitution itself but helping the court to fully assess the dimensions of the problem under consideration.